The main purpose of this study was to test a new radiofrequency capsule localization system in healthy human volunteers. In the absence of a gold-standard for capsule localization, we performed a series of x-ray images to provide 3-dimensional coordinates that were compared to the coordinates provided by a new software created by Olympus Technology. The software produces data by compiling data from an antennae sensor array that is fitted onto a belt that a patient wears while the capsule is active. As the capsule travels through the gastrointestinal tract, the sensor array provides 3 dimensional coordinates for the location of the capsule. The “localization” problem is a hindrance in the utility of capsule endoscopy. Video capsule endoscopy is currently the gold-standard for diagnosing small bowel pathology; however, it is a limited technique in that localizing identified lesions is inaccurate. This impacts the ability to perform definitive and efficient endoscopic or surgical therapies and often can lead to frustrations for both the patient and the clinician. There have been attempts at creating a localization system to address this problem; however, the only commercially available system offers capsule location in 2 dimensions which lends itself to inaccuracies. This study focused on a new localization system that can accurately provide capsule location data in 3 dimensions. Figure 1. 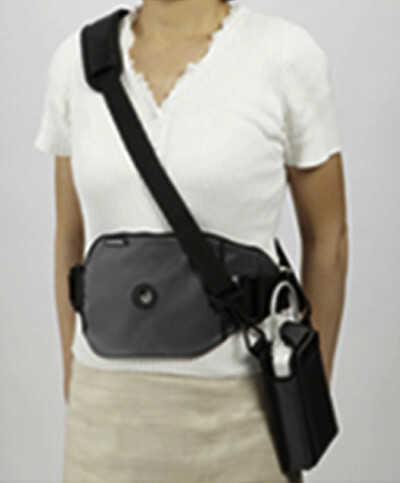 Volunteer wearing the antenna sensor array belt and holster for the capsule real-time viewer. We tested this new 3D localization system on 27 healthy volunteers. Each volunteer had a series of 5 x-rays that were spaced out by 30 minutes starting once the capsule had entered the small bowel. We later compared the coordinates provided by the x-ray to that of the connected 3D software. The average error for the software measurement for each of the 3 coordinates was: X -2.00 cm (SD 1.64 cm), Y — 2.64 cm (SD 2.39 cm), and Z –2.51 cm (1.83 cm). This is comparable to the existing system for localization; however, it provides localization across all 3 spatial dimensions which has never been achieved before. The potential utility of this technology is yet to be seen, however, as it needs to now be studied in a prospective clinical trial for patients with suspected small bowel pathology. As small bowel loops move around in the abdomen with peristalsis, the capsule’s position moves even if it is stuck in a stricture area. What is clinically useful is how far is this lesion from pylorus or cecum. I am not clear how this three dimensional localization will help in the management in any clinically meaningful way.